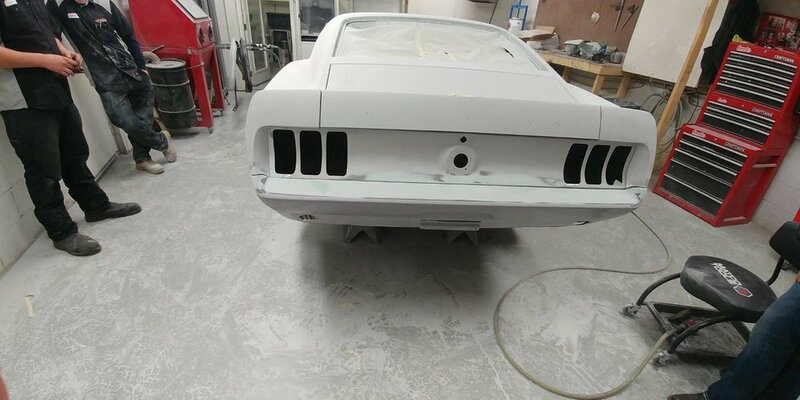 In the process of building a 1969 Mach 1. Projects been off and on for about 8 years. 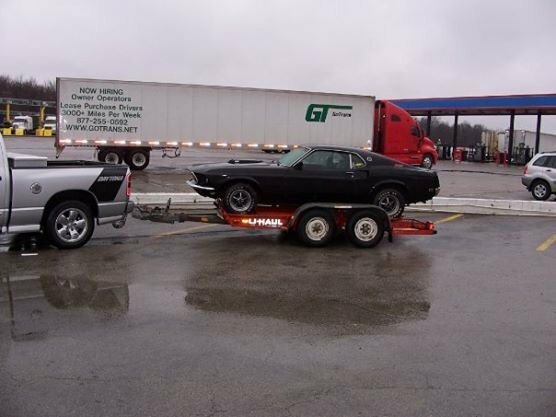 Modifications are as follows: Heidts four link rear suspension, TCI Mustang II suspension, Currie crate rear end w/4-11 gears, wilwood 4 piston discs all around, wilwood manual booster w/proportion valve, Tri-Star Engines 408W crate, Holley EFI, Holly dual sync distributor, Holley EFI fuel tank & pump, performance automatic 4R70W electronic transmission, CVF racing pulley system. 18" Foose Legends rims, Nitto tires. A note to add - I changed the color of the car after installing the engine the first time, went from Ford Chrome Yellow to Ford Graphite Gray (that is the reason for the two colors through out the pictures). Dropping past pictures to bring everyone up to speed. Looking good, love the yellow. 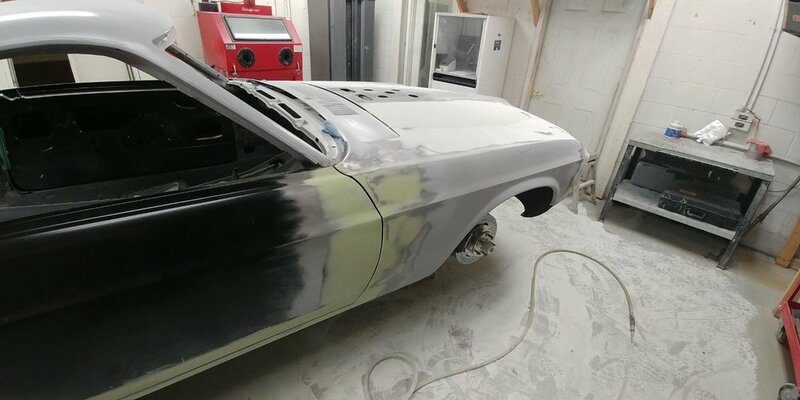 Unfortunately the yellow is no more, I did a 1966 coupe with the same yellow and my friends were bustin my chops for doing the same color again, last fall I yanked the engine out and resprayed it Ford Graphite Gray. Below is my '66 in the Chrome Yellow with a 351W. Photo taken at Elkhart Lake Wis, Road America Racetrack. Wow, lot of work to in-do the yellow. It would have looked good. How did you route your transmission cooling lines? Are you using a separate trans cooler? I am going to use a separate trans cooler as my guess is that the stroker will run hot, and I don't want an in-radiator transmission cooler. I love the other work you did. 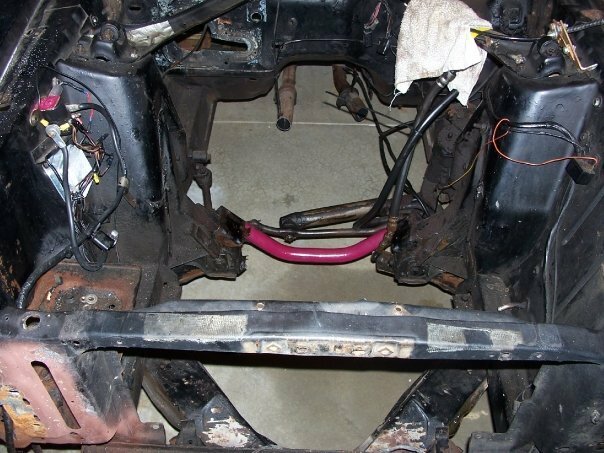 I really like that driveshaft safety loop, looks like it bolts to the sub-frame connectors...? Oh, another question. What are you going to do with your kickdown linkage and the fuel injection ? Went with an external B&M 14,400 BTU cooler. I ran the line from the trans to the internal radiator, then to the B&M, then back to the trans so I'm basically using two coolers. The pictures show the cooler and line runs. I used heat shrink where it passes through the radiator support. As far as the trans kick-down, unsure, have not got that far, any suggestions? The 4R70W does not use a kickdown cable, it is operated electronically with the PSD controller and ECU within the Holley Sniper EFI. I realized that also. I am going old school, with a C-6, so I have to deal with that. Shep sent me some pics of his kickdown setup, which he fabricated. I will likely use a Lokar cable with a custom bracket. Thanks for the cooler and hose routing pics. Fluidyne is going to make me one for my car, that is based on what they use for some of the dirt track racers. I will post the pics when I get that installed, likely in the next month. Your cooling lines run really close to those headers? Or maybe that is just the way the picture looks...? Oh, on the battery tray. I mounted mine to the same 1/2 birch plywood base, then mounted the base to the trunk floor. One reason I did this was so I could use T-bolts (which are flush) to mount the battery box to the wood. The battery box has pretty much zero clearance, so you can't use a conventional bolt on the bottom, and it will also potentially cause a interference/rub/hole in the optima battery. I used a bolt like this, and covered it in DynaMat to ensure there was a cushion between the battery and the battery box. Thanks for the tip on the tray bolts. The lines have good separation, at least I hope so, the headers are ceramic coated so that should reduce SOME heat compared to conventional headers. Once it's all running I can add a heat shield if needed as they rest a-top the frame rails. For the power lug you used to feed the starter cable through the passenger floorpan, did you use this type? Yes. There are 2 sizes. I used 3/8” for the starter. You also need to make sure you get a boot with it for both sides. Wow! Top shelf build there 69Stanger408. I went with JBA ceramic coated, they fit perfect...but I do not have shock towers. Amazing project and originality. The yellow and black is my favorite color on this body. You mentioned you changed it to gray. Any pics? Lots of goodies the past few weeks. Built out my power distribution system in the trunk (Thanks Vic for inventing the wheel). Decided to go with a Vintage Air System, though plans did not call for same, so the front pulley system came off for a new front runner. Luckily, the team from CVF Racing agreed to the return of the mocked up system for an upgrade to the Wraptor single belt serpentine one. Nice touch with the black diamond plate for the battery power center. Thanks Vic, I am going to customize the routes for the AC/Heater lines, going with a bulkhead set up, not using the original locations (maybe through the fender well area) will be the weekend project. Picked up the Master Cool die crimper to make the AC lines. Need to get the evaporator mounted so I know how much room I have for lines and electric. I smoothed over the firewall so finding the location to mount same is challenging....or at least a pain in the back...literally. I'd like to see your idea to route the AC lines. I hate the way the AC and heater lines clutter the engine bay. Working on the Vintage Air, replacement front runner system, and electrical. New mods as my original thought was no A/C. To change to AC required a new pulley system which CVF racing agreed to take my mocked up system in exchange for the upgraded Wraptor single belt serpentine. Nice folks to work with. Taking electrical cues from Vicfreg, he put the thought into it which allows others to follow, shout out to Vic! Thanks... I also used CVF pulley system. I love that these guys are a small business in Minnesota. Really high quality product. My pics all went bye-bye awhile ago, unsure if I'll keep dropping pics, but this the latest. 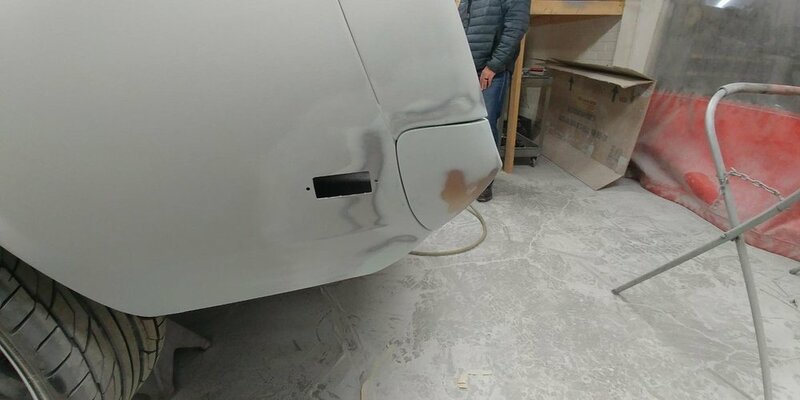 Final stages prior to paint. Shaved the rear bumper and tightened up the body gaps. Hopefully paint in a month or so, waiting on Mustang To Fear seats. Removed the seat pans, moved back 4" (I'm 6'7"), need the seats prior to burning in the risers in new location.